DesignSpark Mechanical enables users to solid model in a 3D environment and create files for use with 3D printers. Using the direct modelling approach, it allows for unlimited and frequent design changes using an intuitive set of tools. This free 3D CAD software is offered as a payment free download, but requires a one-time registration with DesignSpark.com to receive the latest community news and product promotions. In addition, DesignSpark Mechanical Version 4.0 is the first free software tool to seamlessly integrate the open-source Ultimaker Cura slicing software. This feature is the result of close collaboration between RS and Ultimaker, a 3D printing company, and enables users to optimise their designs using expert-tested profiles for 3D printers and materials, and to streamline workflow for maximum efficiency. Other key features of Version 4.0 include: support for 4K and ultra-HD monitors, switching between multiple graphics-rendering drivers and modes; the ability to export 3D geometry into the DreamWorks open-source OpenVDB file format; and various fixes of minor software bugs. Additionally, the tool now supports 14 new languages. 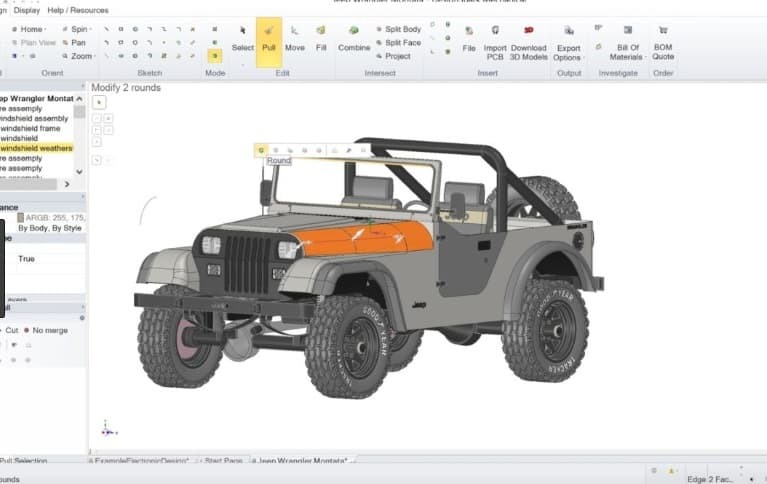 DesignSpark Mechanical supports the idea of Rapid Prototyping through SpaceClaim’s 3D direct modelling methodology using the Pull, Move, Fill and Combine tools that allow a user to interact with digital 3D objects like modelling with clay, all available in the free 3D CAD version. Pros: It is the first and maybe the only software which imports SketchUp (*.skp) files. If you’re a maker person then this software enables a wide array of electronics components via its “RS Components” connection. Actually, the software is launched by them. Cons: Its user interface is a little bit unfamiliar comparing to other well-known CAD softwares.